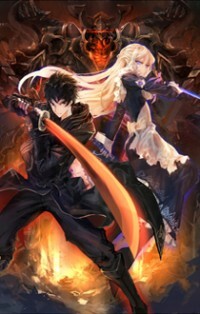 The latest manga featuring a popular online game played by the main character, the start of The New Gate reminded me of Overlord, what with the main character waiting for something to happen before logging off (in this case waiting for online friends to log out before he did), only for him to remain in the game and unable to log out. The game itself becomes something new like what happens in Log Horizon; it seems to be the same world but there are clear differences as the main character investigates. We follow Shin, just Shin (that's what he says), an OP player who just defeated a boss and gained titles that come with some useful abilities, similar to how Kirito got the dual swords skill. As I stated earlier, he waits for other players he made friends with to log out before he does, but for some reason the log out button disappears. Everything else remains the same: his stats, titles and inventory for example. He then decides to finish for the day and goes off to investigate, and he finds out that he's now a rare species in that world that is set many years after the one from the game. This also means that anything he has in his inventory is worth a fortune. There is slow progression with the story as Shin goes around to find out more about the world now that it's changed, including what remains the same from the game and meeting new characters. But the way the story is delivered despite the pace is done well, as you won't feel bored whilst reading the mostly non-action moments. There is action in between, which are made more entertaining through the aftermath and Shin's personality; he doesn't think the strong enemies he fights are as big a deal as others think (you'll see what I mean). Shin is a pretty chilled out guy in general like the main character in Rain, and even when he's fighting strong enemies he doesn't break a sweat, using his skills learned in the game whilst analysing them and how they are in the new world. The story unravels further as we learn that there are a group of people known as the Chosen Ones, which we find out Shin is a part of. It's because the relation is to the game before everything changed in that people disappeared (players logged out). Unfortunately that's as much as you'd come to know about it for now since there aren't many chapters released as scanlations yet (13 chapters). And this was just when there was more action coming into the story. I'm sure it won't disappoint as more chapters are released.